As Martin Luther King Day approaches, I definitely have wanted to discuss Martin Luther King, Jr.’s life with my son. For our lessons this week, we’re reading the biography Who Was Martin Luther King, Jr.? (affiliate link) and completing the book study I’ve created to correlate to it (also available on TPT). I feel that is a great book for understanding the progression of the Civil Rights Movement and Martin’s role in it. But I also realized that understanding the Civil Rights Movement requires understanding that racial discrimination was a reality for those living in the South. One great picture book helps put the ridiculousness of Jim Crow laws into perspective. White Water by Michael S. Bandy and Eric Stein and illustrated by Shadra Strickland (Candlewick, August 2011) is based on a true story from the childhood of one of the authors. 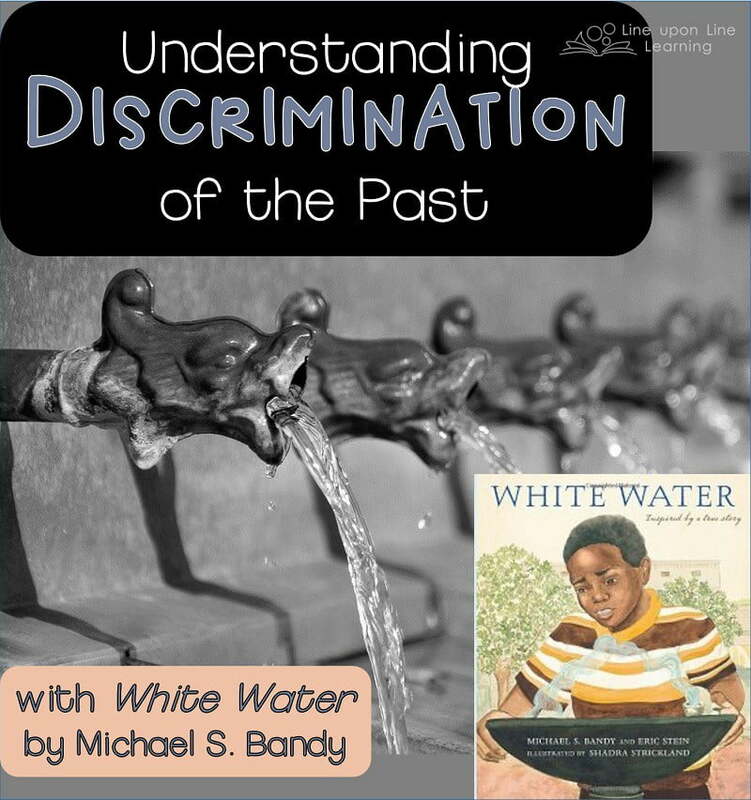 In this story, kids can see what it must have felt like as a young children discriminated against (even for something so simple as using a drinking fountain) and see the strangeness of discriminating when people (and water) are really the same. In White Water, one afternoon, two boys, one white and one black, got off a bus and ran for the drinking fountain. As they both drank from their designated drinking fountains, the black boy wondered what the water from the white drinking fountain tasted like. He found a way to come back to the drinking fountains and try the white water, only to discover it tasted the same as the water from the “colored” drinking fountain: the two drinking fountains were connected by the same pipe. The illustrations are done in watercolor and ink; my favorite spread is that in which the boy ran for the drinking fountain and the illustration shows his toy soldiers keeping cover for him. As kids read the story, they too will feel the frustration the child must have felt. It is told from the child’s point of view, thus helping the kids relate to the era and frustration. Teachers can use this book as an introduction to the Civil Rights Movement. I think reading this book or one similar to it is important before reading about Martin Luther King, Jr. One cannot quite understand the impact he made on the world until one understands just a little bit what the world is like before hand! See More Mentor Monday posts at The Reading Tutor’s Blog! You may also be interested in my best books about Martin Luther King, Jr. Note: Thoughts on this book originally appeared on Rebecca Reads.